Estate Planning as a Family Conversation (NYT) | The Levin Law Firm - Philip Levin, Esq. I thought you would find this article, Estate Planning as a Family Conversation, by Deborah Jacobs, published in The New York Times on March 4, 2010, to be of interest, both personally and professionally, especially for your clients who can benefit from working with an estate planning attorney to ensure that their estate plan is up-to-date and reflects their current dispositive intentions. 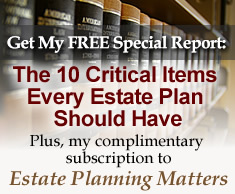 Please do not hesitate to contact The Levin Law Firm whenever we can be of service regarding estate planning matters.